I was upstairs getting ready and realized it was quiet down stairs. If I was eating ice cream for breakfast I would be quiet too. Guess who now asks daddy "can I please have a little bit of ice cream for breakfast". It's pretty hard to resist her cute little face. She now thinks every day is Eat Ice Cream for Breakfast Day :) Not a bad idea! Today was Violet's first visit with her pediatrician in Woodbury. While she has been poked, prodded, inspected, and measured by doctors every day since she was born, today she finally got a "normal" doctors visit. Since moving to Woodbury, we have only had to go to the clinic once, for Sylvia's 2 year checkup, but we were happy with the Dr. then. Today was no different. While to wait was a bit long to get in, mostly due to paperwork, the appointment itself was pretty painless. The put Violet on the Premie curve, so these numbers were a bit shocking. As a point of reference, Sylvia was hovering between the 3rd and 5th percentiles her entire childhood. It will be interesting to see the differences in these two girls as they grow. At just under seven weeks old, Violet is home! It was quite the process, but the time went by pretty fast. We were joking with the nurse yesterday that Jamie and I didn't even get in a stress-related yelling match... Much better than most couples in our situation said the nurse. I guess we will wait for the stress related issues to start once we add sleep deprivation on top of it. To be allowed to take her home, she needed bolsters in her carseat. Seems like an infant insert would be easier to use, but that was a 'no no'. Oh well, that will change soon! I am sure we will have many stories to share over the next few days, but bottom line is she is home! Yeah!!! Violet is six weeks old today. She continues to grow and get closer to coming home. She currently weighs 5# 12oz, which is much bigger than her 3# 4oz birth weight, but still quite tiny as you can see compared to dad's frame. Since Sylvia hasn't seen Violet yet, and it is possible that Violet is coming home next week, we wanted to let Sylvia get to see her little sister at the place she has been growing up the past six weeks. At first she didn't really know what to do. We had to talk in quiet voices, make sure our hands were washed multiple times, and become aware of all the equipment, wires, and beeps. But after a bit, it was no problem at all. The visit was short, about 15 minutes total, but we think that is was good for Sylvia to see her little baby gouda. Next steps are getting Violet home and teaching Sylvia her sisters 'real' name! She continues to grow - up to 5# 8oz already. She has been doing much better on the O2 and body temp regulation. Still working on eating, but since she had her first bottle a bit over a week ago, that isn't too much of a surprise. No certain timeline on when she will be coming home, but could be as early as next week. 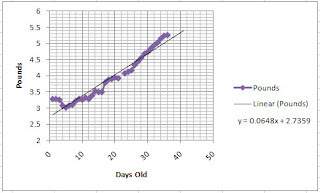 Finally, I had to chart her weight gain since birth. The recent spike in weight over the last two weeks has slowed a bit... mostly due to the change from "forced" feeding to attempts with Jamie and bottles. We will continue to keep you all updated. Today is Sylvia's third birthday... can we now mention the cliches that everyone says about children - "Don't blink or you'll miss it" and “Enjoy it while it lasts, your kids will grow up way too fast.” While they may be cliches, they sure are true. This past Saturday, we had some family over to celebrate Sylvia's birthday a few days early. The weather was great, the food was great, the Costco cake was awesome! It sure is amazing the difference one year makes. This year she sat like a "grown up" and enjoyed her cake and ice cream without smearing it all over her face (or her cousins face)! Present time was also enjoyable... The main difference this year was fewer toys and more educational "games". It is never too early to start learning - and learning is fun, right? As we prepare for Violet to come home, we are going through old bins of baby stuff. Jamie came across a bag of Ginny dolls that Megan was going to toss out when she moved to San Fransico. If you don't know about these dolls, they are more of the collectable, stick'em on the shelf type dolls. Not the typical kids play doll. "Mom, I found a head!" Sylvia was acting very similar to the Honey Badger. For those who are not aware of the honey badgers powers, you should click on the name above to learn more. The Celbration was smaller this year than in years past, but the weather was absolutely perfect. Of course the island was calling, and the children being one year older enjoyed it even more... The Willards, Stracks, and Brodds made this years party - I guess this is the calm before the storm, as next year marks the 10th anniversary. As mentioned the weather was great, food was good, and no major injuries to report, so all in all it was a good day. Changing gears to Violet. Since we missed posting her 4 week update, we will go with a 4.5 week update instead. After an up and down 10 days or so, she is off the O2 again. She needed a small dosage of steroids to help with the lung development, but it seems to be doing exactly what they are supposed to do. The nurses keep calling her "chubby" (which is a good thing when you are in NICU) and today she weighed in at 4# 15oz, so just about to the 5# mark! A couple of days last week she was growing 2 ozs a day! While I consider this bow 'a bit much', one of the nurses was quite proud of her achievements. While it may not be obvious from the pictures, she does open her eyes from time to time. She has been making good strides towards wanting to nurse. The doctors will start to try bottle feeding soon to see how that works. Since that is one of the gating items to coming home, it is a good thing to get going on that. She is in great hands and had a great weekend. She continues to grow, is sleeping in a crib, and breathing room air. Next year, she will be able to take part in the celbration in person!